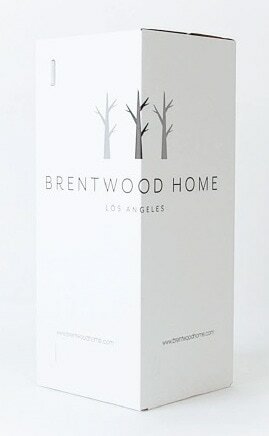 Just when you thought Brentwood Home perfected the bed-in-a-box they introduce their most premium mattress yet. The Cedar Natural Luxe Mattress features an innovative design along with superior materials. Creating a luxury latex hybrid mattress that has details for days. Using some of the most eco-conscious natural and organic certified materials for unparalleled comfort and support. The Brentwood Home Cedar Natural Luxe Mattress is about as luxurious of a mattress that you will find. This medium feeling mattress is right in the sweet spot and isn’t too firm or too soft. Follow along as we highlight all the amazing aspects of this mattress in our Brentwood Home Cedar Mattress review. And, make sure you utilize our exclusive coupon (found just below our video) when purchasing your new Cedar mattress! 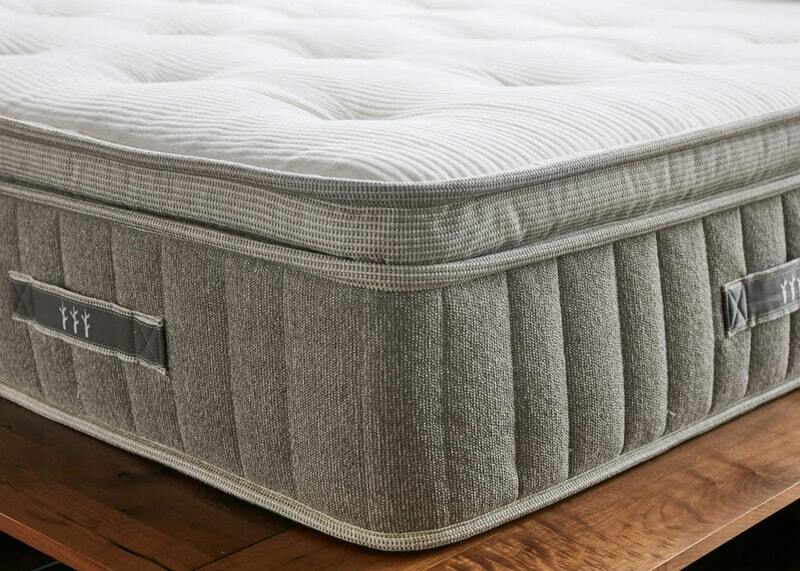 This 15″ thick premium mattress uses not just one, but two layers of durable Dunlop latex to create perfect pressure relief. The double layer of latex even features a specially cut secondary layer that is precisely grooved. This unique design creates perfect contour to your body in all sleeping positions for the best comfort. Combining these amazing layers with a solid coil system provides years of durable support and sustainable comfort. It is even covered in an organic cotton cover with wool and cotton quilting for added plushness and softness. This mattress is ideal for the warm sleeper and is great for circulating air and regulating temperature. The natural wool is also perfect for wicking away moisture while the ventilated Dunlop latex helps air to flow. And even though there is plenty of buoyancy and ease of movement, partner disturbance will be minimal. The Cedar mattress uses provides a stable and consistent feel on every inch of this mattress. All together making an exceptional night of sleep. All of the Brentwood Home mattresses, including the Cedar, are made in the USA. It also comes with a 365-day trial period and a 25-year warranty. This latex hybrid bed uses the best eco-friendly materials. As well as unique and innovative design to make a very comfortable and precisely supportive and responsive mattress. This is a very luxurious and pressure relieving mattress that goes above and beyond in every detail to make a truly premium mattress. Get ready for your best night of sleep every night. Also, don’t forget to follow the image below to use our EXCLUSIVE 15% OFF coupon with code: OURSLEEPGUIDE15. Make sure you also check out our reviews for the other Brentwood Home mattresses too, the Crystal Cove, Oceano & Ojai. Below we have our comprehensive and detailed Brentwood Home Cedar mattress review. We will go through how it performs for off-gassing, comfort, motion transfer, sleeping cool. As well as edge support, value, material, trial and warranty. The nice thing with any mattress purchased through Brentwood Home is the choice of options for delivery. This mattress is a very heavy bed, coming in at 135 lbs for the queen size. For no fee you can have this mattress compressed and sent in a box right to your door. If that is your choice, than you will definitely need two people to get it to where it needs to go. However, you also have the option of paying a $199 up charge for White Glove Delivery instead. This fee provides the convenience and ease of somebody else bringing the mattress to your bedroom and setting it up and removing all the garbage. For another $76 they will even take your old mattress too. As far as off-gassing goes it will be minimal. Regardless of whether it is shipped via box or hand delivered. The Cedar mattress uses natural materials from top to bottom. Brentwood Home focuses on making their products from the least toxic materials. Including Dunlop latex and an organic cotton and wool cover. There may be a bit of fragrance from this mattress but it will mostly be a natural smell, if any at all. When we unboxed this mattress it was definitely a two person job. It is very heavy and very substantial which is a great testament to what it’s made of. When we unrolled it there were hardly any noticeable odors at all and if anything very faint, natural smells. It didn’t take too long to fully expand but giving it a good 24 hours is always a good idea. See just how easy it was for us to unbox and set up the Cedar below! When setting up your new mattress it will need a foundation that provides a flat, even surface that will support the weight of the mattress as well as the sleepers. It also will need to be the right height for you as well as be aesthetically appealing. The Cedar mattress will work great on a box spring with or without a frame, an adjustable base, a platform bed or slatted bed. To find a foundation that would work for you check out our frames & bases reviews. The Brentwood Home Cedar Mattress is a wonderful design that creates sublime comfort and optimal ergonomic support. This hybrid bed utilizes the natural buoyancy and support of Dunlop latex foam for the top comfort layers. As well as the core support and long term durability of a thick and sturdy coil system. 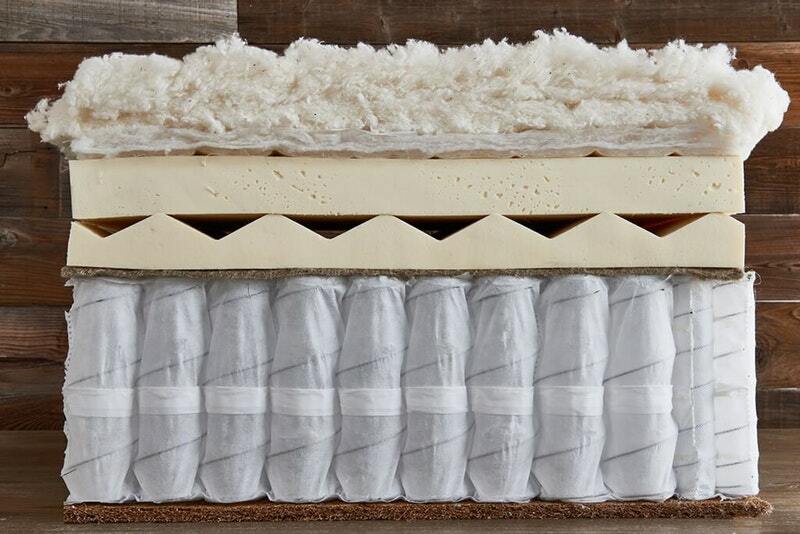 Brentwood Home than pairs these layers together with a wool and cotton quilted cover to make a mattress that is natural and organic as well as supportive and perfectly balanced. Not only is this mattress an ideal feel, but it also has targeted zones with specially cut latex. This creates pressure relief for your hips and shoulders as well as extra support for your lower back. This makes it especially perfect for side sleepers who need their shoulders and hips to sink in enough. As well as back sleepers who need added lumbar and neck support. 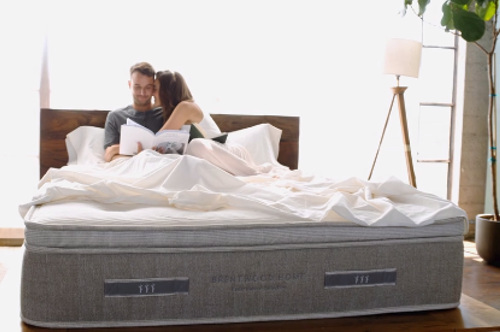 This mattress even works well with stomach sleepers and is really great for couples. This ideally comfortable mattress will be a perfect medium feeling bed. On a firmness scale, as seen below, it will fall right around a 5 to 5.5. This feel is great for all sleeping positions and very optimal for side and back sleepers. Not to mention, if you are a heavier person this mattress would be a fantastic choice. It uses durable and dense materials that are thick and have a great lifespan. The latex makes a very comfortable, pressure relieving bed that is easy to move on. As well as a solid and sturdy coil system to provide the necessary support and foundation. We absolutely enjoyed every minute of sleeping on this mattress. The materials made a perfect combination of balanced support and ideal spinal alignment in all sleeping positions. The comfort was optimal for both of us and the Dunlop latex proved to be both pressure relieving as well as just responsive enough to move on easily. It wasn’t too buoyant or too conforming, and really was a perfected blend of the most durable materials that were also natural. This bed really goes above and beyond in every detail and comfort was definitely one of them. The motion transfer from a latex hybrid bed may be more than an all foam or traditional hybrid. This is because the materials in the Cedar are naturally more buoyant and springy. The responsive layers of Dunlop latex are dense enough to cut down on vibrations, but may still produce a little movement. The coil system uses individually fabric encased springs to cut down on the bounce as well. Considering that this bed uses highly responsive materials the end result does produce good motion isolation. The Dunlop latex and pocketed coils work well together to reduce the potential disruption that could happen. Unless you are a very light sleeper or very sensitive to movement, this mattress would did great for providing minimal motion transfer. 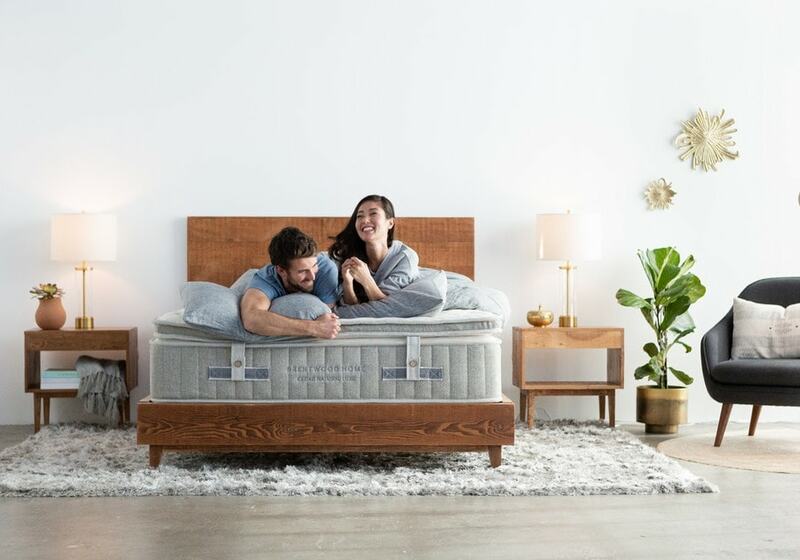 The Cedar by Brentwood Home is not only one of our favorite natural mattresses it also holds the #2 spot for the Best Mattresses for Hot Sleepers. This is because the materials and design of this made make it perfect for staying temperature neutral throughout the entire night. The combination of coils, latex and wool and cotton cover make it ideal in every aspect for sleeping cool. To start right at the surface of the bed with the cover, you have a super soft and organic breathable cotton. This sits directly over a thick pad of organic wool batting. Wool may make you think of a cozy winter sweater but the truth about wool is that is a great for not only keeping you warm and dry but also cool and dry. The best part about wool is that is naturally moisture wicking. This luscious comfort layer also is a natural fire barrier, anti-microbial and resistant to dust mites. Making it cleaner and safer for the sleeper. Under the cover are two layers of naturally aerated Dunlop latex. Not only is this material able to easily dissipate heat but is also more responsive. This makes for a surface that is easy to change sleeping positions on and will never make you feel stuck. When able to move easier you are less likely to get cocooned in one position that will hold heat. Lastly this mattress also has a coil system. A coil system is a must for any truly warm sleeper. The space between the coils allows for any heat trapped a place to escape. This allows for heat to move away from your body instead of pooling underneath it like it would in an all foam, specifically memory foam bed. The coils also provide a solid support system that doesn’t let you sink in too far. As well as doesn’t allow you to feel stuck either. Between the cover, latex layers and coil system we never felt warm at all while sleeping in the Cedar. This mattress didn’t accumulate any excessive amounts of heat and allowed us to sleep naturally cool throughout the entire night. Two enthusiastic thumbs up for the benefits of natural materials that work with your body to stay comfortable night after night. When looking at the edge support of a mattress you not only get an idea of the perimeter durability but also the mattresses durability as a whole. Having a solid well supported edge creates a mattress that can be fully used from end to end and side to side. It will have a consistent feel that makes sleeping on the edge no different than the middle. The Cedar does just this and allows for a sleeping surface that can be used from every angle. By incorporating a coil system that uses edge retention coils around the sides the perimeter is strengthened. These coils provide better support and less sink making sitting on the edges even stable. Over this durable coil system are two layers of dense high quality latex. These layers provide support and comfort that isn’t easily broken down, making it great from middle to edge. Sleeping on this mattress was very consistent and even. And we even found sitting on this mattress to do much better than the majority of mattresses we have tried. Making a mattress that is durable and solid from every angle and position. The Brentwood Home Cedar mattress is $2899 for a queen size, however that doesn’t include out coupon which makes it ONLY $2464! It also comes with a 365 day sleep trial as well as a 25 year limited warranty. Don’t forget that shipping is free unless you opt for the White Glove Delivery service for an additional $199. This mattress is super thick and heavy and well worth having someone else set up. This superbly designed and detailed mattress is made of the best natural and durable materials. If you want a mattress that is comfortable and responsive as well as very supportive this is a great option. It also is ideal for anyone who is a warmer sleeper and needs a mattress that won’t retain heat. Anyone who likes the feel of latex and solid support of coils really shouldn’t look any further than the Cedar mattress. Also, make sure you utilize our EXCLUSIVE 15% OFF coupon with code: OURSLEEPGUIDE15. This code makes this mattress an AMAZING deal at only $2464. Also, use this code on your new mattress and any other items found on brentwoodhome.com. 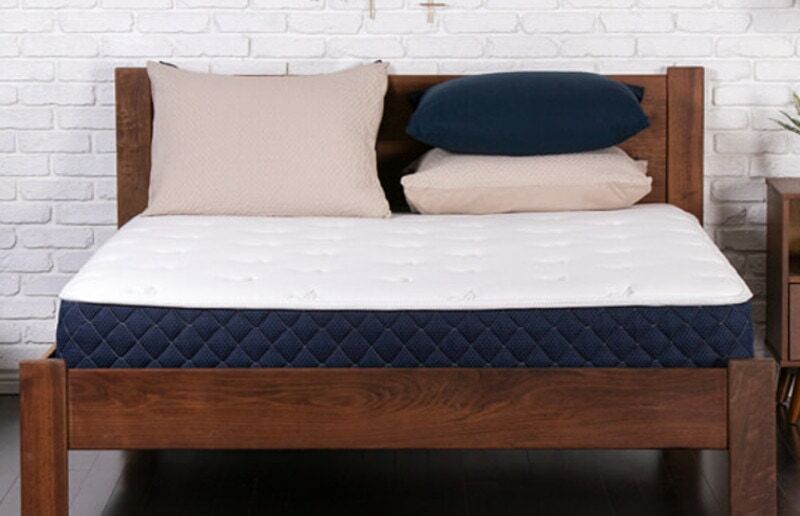 The Cedar by Brentwood Home is a 12″ mattress + 3″ topper making a total of 15 inches. 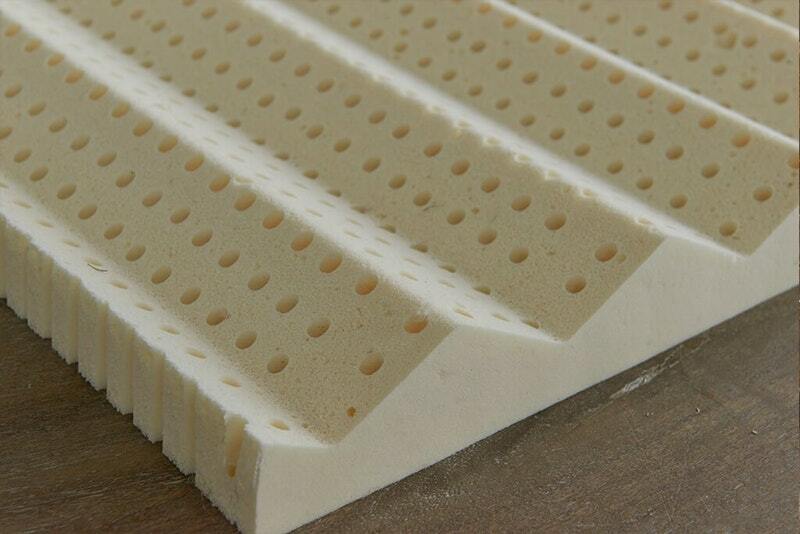 The top layer consists of 2″ of 4lb density Natural Dunlop Latex. This layer is a medium feeling all natural latex layer that provides a easy to move on pressure relieving layer that quickly adapts to your body and sleeping positions. This is a smooth layer of foam and will feel very consistent and pliable. The second layer is another 2″ of 4lb density Groove Natural Dunlop Latex. This layer is the layer of latex that is specially cut to create targeted zones for better pressure relief for your shoulders and hips. As well as extra support in your back. It also helps with air flow, circulation and precision comfort. Read more on why we consider Cedar a candidate for top Best Mattress for Heavy People. The third layer is the coil system. This 8″ thick coil system is made up of 1130 coils in a queen size of individually wrapped Pocketed Coils. This layer is the core of the bed and will be where the bulk of the support, longevity and durability come from. This coil system allows for precise contouring around your body for exact support as well. The perimeter of the coil system uses edge retention coils for added edge support. And the lumbar zone uses reinforced coils for even better support. The very bottom layer is a 1″ of Coconut Husk Support. This innovative and sustainable base layer is not only durable and readily available, but it happens to be naturally antimicrobial for an even healthier sleeping surface. All of this is wrapped in a organic cotton cover with an organic cotton quilting and layer of wool over the top of the mattress. This extra layer of plushness is also breathable and hand tufted. The New Zealand wool is a great natural moisture wicking material that also helps with air circulation and the cotton cover has a natural fire barrier made of hydrated silica sand. The attention to detail, quality and sustainability make this mattress safe, comfortable and perfect for anyone who wants a unbelievably comfortable and supportive latex hybrid bed. The Cedar mattress has a 365-night sleep trial period. This is a quite a bit longer than many other online mattress companies offer. This allows you a full year to see if it is the right bed for you. 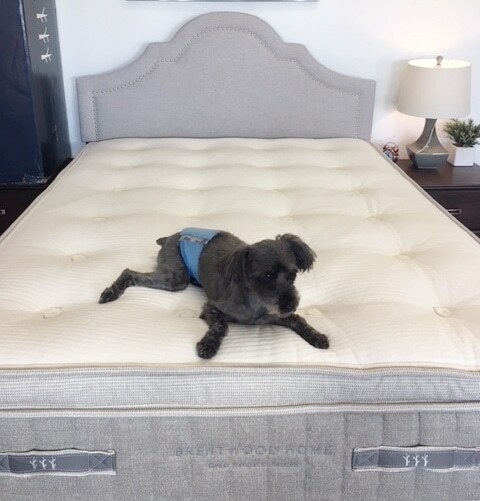 We highly doubt that this mattress won’t be loved instantly, but if for some reason it doesn’t, Brentwood Home will gladly work with you to make sure you are taken care of. And a full refund as well as removal will take place. If you are looking for more specifics for the Brentwood Home warranty or trial period find out more at brentwoodhome.com or for a helpful tool check out Our Mattress Warranty & Trial Period Guide. We can’t say enough positive comments in our Brentwood Home Cedar mattress review. But, don’t just take our word for it, see what others who have slept on the Cedar are saying. 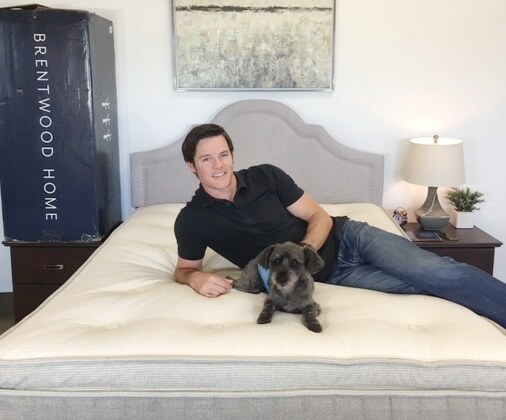 “I’ve tried a myriad of mattresses.. From other brands such as casper, purple, simmons, sealy, temperpedic, as well as other beds of brentwoodhome (sequioa and coronado). So far, I love Cedar the most. I’ve kept it for 6 months now and waited to see if I needed to return the bed but nope. I haven’t had back soreness on the bed and have restful nights with it. 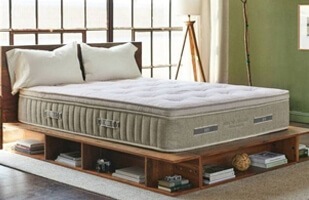 Highly recommend this bed.” – Will W.
“This mattress combines a perfect level of support and cushion for side-sleeping. I am able to sleep through the night with no discomfort. This is further facilitated by knowing I am also surrounded in all-natural materials, thoughtfully made in LA.” – Mace b. “My new Cedar mattress is so comfortable! I’ve been getting great sleep. I think the mattress is so comfortable because of the soft pillow top, feels like I’m sleeping on clouds. 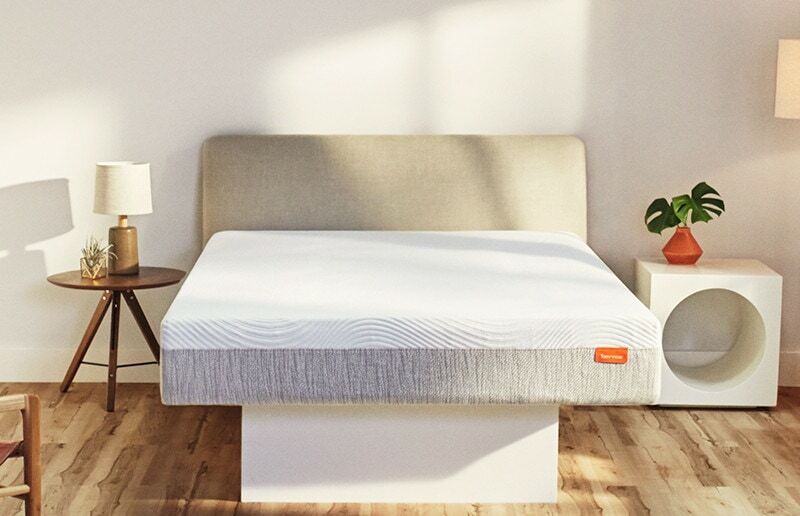 I also love that the mattress is made out of organic materials, making it a safe and healthy choice for my young children.” – Lina T.
“We went from an IKEA mattress to the Cedar and OMG I feel like I’ve gotten years back on my life. Seriously. I sleep better and no more waking up with body aches and pains. The round pinwheel things on the top of the mattress took a minute to get used to but I don’t notice them anymore. I recommend this mattress to everyone!” – Lacy Y. 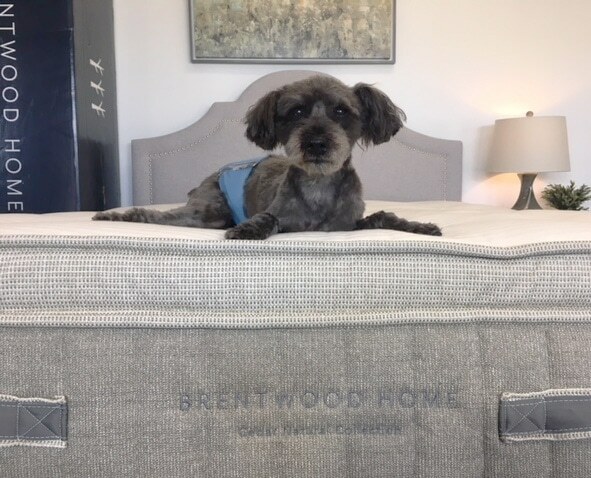 It doesn’t stop at the Brentwood Home Cedar mattress review! Make sure to check out our other reviews and comparisons featuring Brentwood Home. Their other mattresses available are the Oceano, Ojai and their newest two-sided bed, the Crystal Cove. And see how the Cedar does when compared to other brands too. Including the Cedar vs Avocado and the Cedar vs Zenhaven. This latex hybrid mattress is one of the best mattresses we have tried to date. The Cedar by Brentwood Home went above and beyond meeting and exceeding our expectations across the board. Being supremely comfortable, ideally supportive and sleeping cool. All while having minimal partner disturbance and solid, durable edges and materials. All in all, this bed was AMAZING! You like a very premium, well made durable mattress that uses natural & eco-friendly materials. You like the feel of a true medium mattress that uses latex to groove to your body and relieve pressure as well as uses a solid, durable coil system. You like a mattress that doesn't retain heat, has minimal motion transfer and is very sturdy and solid. You like buying from a company that has great customer service, a fabulous reputation and years of experience.